I've been in the grip of general living for the last 2 days. I finally grabbed some time in my studio off and on today and got this cute combo project finished. Before I go into details I want to do a little bit of clapping first. At The Paper Players I won the Headliner Badge for my vintage card Enjoy The Journey, since I don't feel I do vintage very well this is a tremendous win for me. Thank You so much ladies, and if you all haven't checked out The Paper Players hop over and add them to your challenge schedule, I bet you'll have some fun. Oh, Yes, don't forget to come back in the morning for my second week as Guest Designer at Tuesday Morning Sketches another great challenge blog with lots of talented ladies to glean inspiration from. Now, on to the details on my combo project. Daisy Doodles Creative Challenges is having a really fun blog hop with some digi stamps up for grabs. 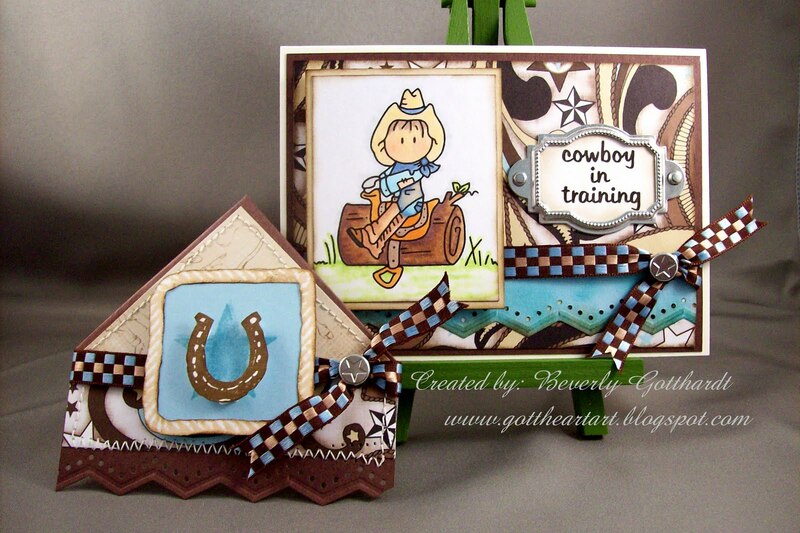 This little cowboy in training on my card is a WOC digi. I'm finally feeling more comfortable with digis and if you're not familiar with them they are very affordable, easy to store(on your computer), and very fun to color. A lot of the digi companies give instructions on how to download them, so don't be afraid to jump in the digi water and take the plunge. After you do the hop, the challenge this week is to create a card and a project to go with it. I chose to make a corner bookmark that I got the instructions for from Splitcoast Stampers. Once you get to their site just click on resources and it will take you to an array of projects. I think you have until Friday to join in on the hop and challenge, hop on over for some rip roaring fun. I'm actually entering this in 2 Challenges and I have to give some kudos to the girls at "Just Us Girls" Challenge . I've been playing in their challenges for awhile now and each week of the month they have a different kind of challenge. Keeps things very fresh and interesting, I think. I'm using their sketch for my card. I've given you links to some fun challenges, so if you didn't know about them be sure to check them out if you like a good challenge! Supplies: Cream card blank 4" X 5 1/2" Halcraft, Papers: AdornIt-Old West Collection, Stampin Up-Chocolate Chip, Baja Breeze, Whisper White, River Rock, Stamps: WOC digi, CTMH-C1306 Genuine Country, Ink: Stampin Up-Baja Breeze, Soft Suede, Ranger Distress Ink-antique linen, PrismaColor Premier-Dark Umber, Copic markers-B000, B95, B00, YG03, E00, E37, YR61, W-1, C-1, E35, E13, R02, YR14, Y32, E51, Colorless Blender, Stampin Up-Hodgepodge Hardware, Martha Stewart zigzag border punch, ribbon-Hobby Lobby, sewing machine, pop dots. What a lovely ad for Daisy Doodles. Your creative set is so cute. That little cowboy is just adorable sitting there on that log. Thank you for joining the challenge and saying such wonderful things about Daisy Doodles. WOW!!! Beverly this is an adorable set for a little guy! Love the browns and the pop of blue! fab little cowboy!!! Thanks for playing along with Just us Girls this week! Hope you join us next week! Beverly...this is a SUPER set. I love your colors, layout and EVERYTHING about this. Well done! Thank you so much for your post and your project! We are soooo glad that you played along with us at Daisy Doodles! Hi Dear Beverly I love your VINTAGE card yuuuhhuuu I am happy you won there and I will see the next challenge on there and try to join too....again congras on your win my dear ..
Now about your west card yippiee this is soo cuuutee and love your bookmark too...I wish I can make a bookmark so pretty like you made....love love this my dear...my I have it for me...hehe just a joke but if you send it to me I will be soo happy....Thank you so much for playing with us at Daisy Doodles. This is a fabulous set. I love that corner bookmark. Any little boy will love receiving these projects. Thanks for joining us at Daisy Doodles. What a cute little boy set... I love your corner book mark...TFS! This is so, so pretty, Beverly! Your coloring is so wonderful, and you've used the JUGs sketch to perfection! Love the corner bookmark too! I'm going to check out your book blog...I love to read and love to get some new titles to read! Thanks for playing with Just Us Girls! Beverly this is completely fantastic!!!! Love your card and the fabulous corner bookmark to go along with it!!! Thanks for playing along with Just Us Girls!! !